A busy week ahead including a Federal Open Market Committee (FOMC) meeting, announcement on a selection for next Federal Reserve (Fed) Chair, possible release of some details for the tax plan, and a look at the September employment situation. President Trump is said to be leaning toward naming current Fed governor Jay Powell as the next Fed chair. The President has previously indicated he will make his decision before he leaves on his next foreign trip next week. Friday’s employment report is expected to show the economy added 308,000 jobs in October and the unemployment rate unchanged at 4.2%. With Janet Yellen’s term as Fed Chair possibly ending early next year we felt it prudent to compare the state of the economy when she began her term to now. During her tenure, the stock market is up 50%; the unemployment rate was reduced by a third; wage growth accelerated; the output gap closed; and core inflation remained stable. Whoever ends up leading the Federal Reserve next will be assuming the reigns of monetary policy from a healthier starting point than when Janet Yellen was first confirmed. Not only will the incoming Fed Chair be dealing with a different economy, but fiscal policy could also be significantly different. On this front, we expect to see the details of the President’s tax plan get fleshed out relatively soon. Negotiations will begin in earnest as this information becomes available. The combination of shifting fiscal and monetary policy has the potential to significantly shape market expectations and behavior in the year ahead. The most important data this week will be the September employment report. We expect to see solid employment gains in the neighborhood of 250-300k net new jobs, and solid wage growth. 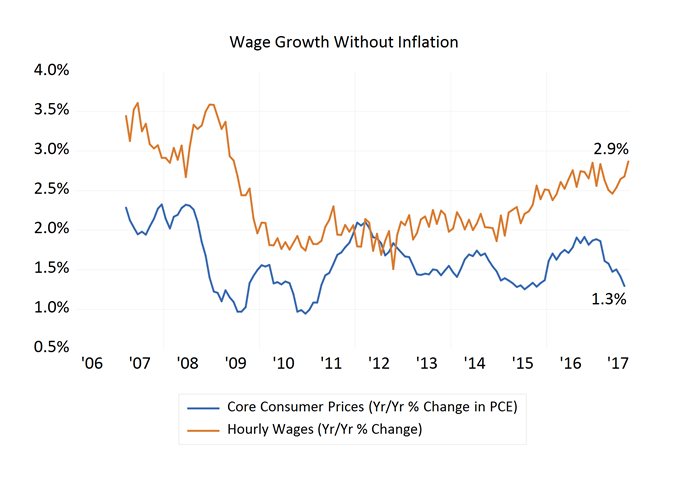 The combination of improving hourly earnings and low inflation (graph below) is helping to boost household purchasing power and helping to sustain domestic demand in the United States. In turn, this growth is helping to fuel sentiment, earnings, and growth in aggregate wealth.